White-tailed deer Odocoileus virginianus goudotii, photographed by Petruss. 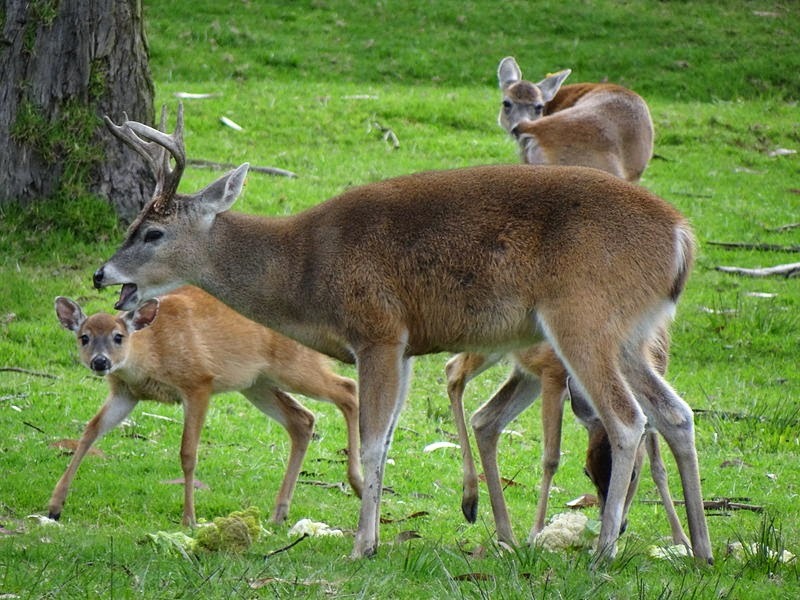 The Odocoileini includes the endemic New World genera of deer, together with the reindeer Rangifer tarandus. Monophyly of the group is supported by molecular data, and by the presence of a vomerine septum dividing the choana into two chambers (Gilbert et al. 2006). The brockets Mazama and pudus Pudu are small deer with the antlers as simple spikes only; the remaining genera have the antlers branched. The reindeer or caribou Rangifer tarandus is found in boreal regions of both Eurasia and North America; it is the only deer species in which both males and females grow antlers. The genus Odocoileus, found over a large part of both North and South America, includes the mule deer O. hemionus and the white-tailed deer O. virginianus. Mature male mule deer have dichotomously branching antlers whereas white-tailed deer have tines branching vertically from a curved main beam. [GD93] Garland, T., Jr, A. W. Dickerman, C. M. Janis & J. A. Jones. 1993. Phylogenetic analysis of covariance by computer simulation. Systematic Biology 42 (3): 265–292. [GRH06] Gilbert, C., A. Ropiquet & A. Hassanin. 2006. Mitochondrial and nuclear phylogenies of Cervidae (Mammalia, Ruminantia): systematics, morphology, and biogeography. Molecular Phylogenetics and Evolution 40 (1): 101–117.